Rebecca Comerford | Eat well. C'est chic. Welcome to my series of posts in collaboration with Share The Love Yoga, an innovative website that brings affordable yoga to you in your city. 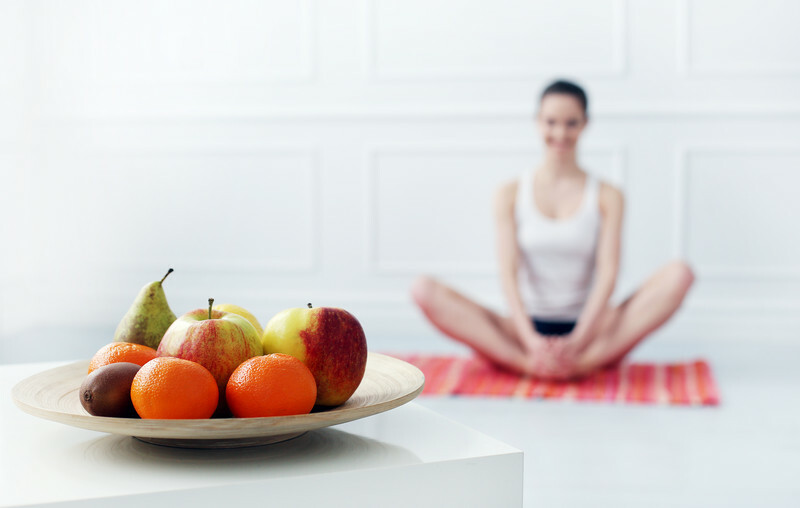 In an effort to make the world’s yogis a little healthier, these posts will offer nutrition tips that are relevant to everyone, but especially those leading an active lifestyle of yoga and more sweat-breaking activity. It’s a choice many individuals make for different reasons. In the case of yogis, the choice is often an ethical one. No matter what reason you have for eating a vegan or strict vegetarian diet, it’s extremely important for short and long-term health to ensure that all of your nutrient needs are met. Yogis ask a lot from their body during their practice. Feeding yourself what your body needs to be strong and healthy is essential so that you can keep practicing to your fullest potential and push yourself without compromising your health. I know that one of the most annoying things a vegan can hear is “Where do you get your protein/B12/calcium/omega 3/iron?” Of course there are sources of these nutrients in a vegan diet, but sometimes it can be tricky to get enough of them, get them in the right ratios, or to optimize their absorption when we are only looking to plants to fuel up. 1. Vitamin B12. This nutrient is key for energy production, the health of the nervous system, DNA replication and to prevent certain forms of anemia. It’s typically consumed through meat and dairy. This is one of the trickiest nutrients to get enough of as a vegan. 2. Calcium. Critical for skeletal and dental health, as well as nerve function. This nutrient is usually consumed through dairy in a standard diet. 3. Omega 3. This essential fatty acid nutrient is critical for heart health, brain health and skin health, and comes in several forms. There are sources of omega 3 in vegan diets. However, the “converted form”, DHA and EPA found in fish and fish oils, are harder to come by in vegan sources. The body’s conversion of omega 3’s in plant sources into their active form isn’t always the most efficient, and deficiencies can result. 4. Protein. This macronutrient is used to rebuild the tissues of the body. It’s also used as the raw materials for hormones. There is certainly protein found in vegan foods such as grains and legumes. However, getting the amino acids in the correct ratios is essential for your body to be able to properly utilize the protein you consume. 5. Iron. This nutrient is a key building block for hemoglobin, the oxygen carrying particles in our blood. If you want to sustain those tricky asanas, oxygen in the blood is a must. The form of iron in plant foods is chemically different and less absorbable than that in animal products. 1. Vitamin B12. Supplements are often the way to go for vegans looking to maintain healthy levels of vitamin B12. However, there are some food sources of B12 that can help vegans stay healthy. My favourite is nutritional yeast (available at health food stores). Opt for one in a sealed container over a bulk bin and store out of the light as B12 can be light sensitive. You can use this stuff in vegan “cheez” sauce (try ohsheglows.com for recipes) or sprinkled over brown rice pasta instead of parmesan as it has a slightly salty-cheesy taste. 2. Calcium. There are actually a lot of incredible sources of calcium in the vegan diet. The trick is eating them regularly and while supplementing vitamin D to help with absorption. Sources such as sesame seeds (and tahini), bok choy and kale are delicious and healthy ways to get calcium in a vegan diet. 3. Omega 3. Incorporate a vegan EPA and DHA supplement. The source is usually algae (which is where fish get their EPA/DHA from!). 4. Protein. There are definitely good sources of protein in a vegan diet, and society’s obsession with eating protein may be a little blown out of proportion, but it’s also important to eat protein mindfully when following a vegan diet. Combining certain foods will provide the body with the correct ratios of amino acids making the protein more easily absorbed. Some sources of complete protein are quinoa, buckwheat, hemp, chia seeds, rice and beans together, and Ezekiel bread. 5. Iron. Certain plants, such as leafy greens like spinach and kale, contain healthy doses of iron. However, as they are in the less absorbable “non-heme” form (as opposed to heme iron in animal products), our body may simply pass the iron from our plant foods. To increase the absorption of non-heme iron in plants, eat them with a source of vitamin C, such as lemon juice. I hope you find these suggestions for avoiding nutritional deficiencies while following a vegan diet helpful. Eat well, yogis! It can be difficult to know what to eat and when for an active yogi. What do I mean by an “active yogi’? I’m referring to those who practice yoga but who find themselves active day-to-day off the mat; those who maybe incorporate any combination of spinning, running, weight-lifting and cross-training into their lives. These individuals will have elevated caloric needs, and if they’re not careful, can accidentally experience fatigue and even muscle wasting if these needs are not met. As we know, the source of your calories is as important as how many consumed, so the kinds of foods yogis turn to for fuel is crucial to their health and progress. The body’s needs during a workout are quite different compared to those after a workout during recovery, so what you eat, and when, can make or break how you feel and perform during yoga or a workout, as well as the next time you flex your muscles. For instance, the body’s demands for protein are highest directly after a workout, and the timing of protein consumption is crucial for muscle recovery. Carbohydrates are used during the workout for energy as well as afterwards to replenish the body’s energy stores. 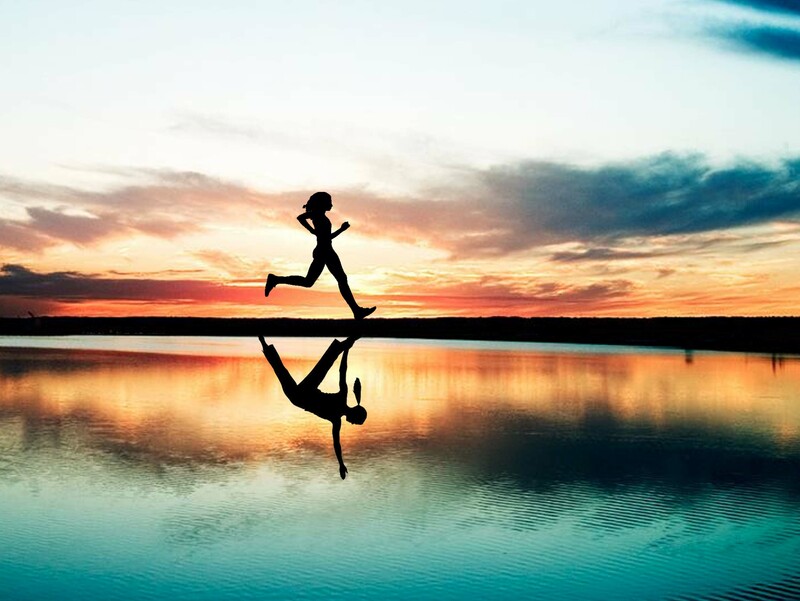 Healthy fats are best consumed away from workouts completely because of their slower digestion rate which can make the body feel sluggish during exercise. Principle: It’s important to provide the body with it’s preferred form of energy – glucose – for optimal sport performance. Carbohydrates are the main source of glucose and the so consuming carbs before a workout is the way to go. They will be quickly used as energy during the workout, so no need to fear their conversion to fat. It’s important not to overeat prior to working out to avoid nausea or a heavy feeling. Banana: Again, like dates, bananas offer a blend of sugar and fibre, providing immediate and long-term energy. Bananas are also a great source of potassium, an electrolyte that helps regulate muscle contraction. Best before: power yoga, weight training, running, cycle/spinning. Mix 500 mL with 1 tbsp of raw honey, the juice of half a lemon and 1/4-1/2 tsp sea salt. Mix in a water bottle and bring on the go for endurance sports such as cycling or running. The honey and lemon juice provide the body with energy while the salt provides electrolytes that are lost through sweat, and the water provides hydration. Principle: After a tough workout that has taxed the muscles, it’s essential to provide the body with protein as well as carbohydrates to repair muscle tissue as well as replenish glycogen stores in the muscles. The ratio of carbs to protein will change depending on the type of exercise; for endurance cardio, replenish with a ratio of 4:1 carbs:protein. For weight training, the ratio will be 2:1, and a workout that uses both cardio and weight training is best suited to a 3:1 recovery snack. Don’t get caught up in the numbers. Just try to remember that cardio workouts need more carbs than protein for recovery, and less carbs for weight-training. In general, it’s best to avoid eating a large amount of fat before, during, or directly after a workout. Protein Shake: Protein shakes are one of the easiest options for a quick, satisfying snack after a workout and their carb to protein ratio can be easily manipulated by adding or reducing the amount of carbs used. There are many good quality protein powders on the market, both vegan and dairy based. I like to add leafy greens, fruit and almond milk to my protein powder for a well-balanced smoothie. Boiled Eggs with Apple Slices: If smoothies aren’t your thing, try one or two boiled eggs with a sliced apple. The carbs in the apple and the protein in the eggs will help the body to recover after your workout. Best after a workout that uses both cardiovascular and muscle-toning activities. Kale Salad with Chicken Breast: The relatively high dose of protein and lower dose of carbs in this meal makes it ideal after a weight training exercise session. Dress with lemon juice and 1 tsp of oil. As always, it’s best to listen to your body’s needs during and after a workout. If your body requires more energy during a workout, try eating a little more easily digested carbohydrates before working out. If you tend to feel “bogged down” if you eat, skip the pre-workout snack but be sure to re-fuel after you’re finished exercising. Every body is unique and therefore has unique needs. Extremely high in antioxidants. They ORAC (scale that measures antioxidant activity) score is off the charts! Blows blueberries out of the water (but keep eating blueberries). Very rich in vitamins, including B-complex – crucial for good mood and stress coping – as well as folic acid. Can help to correct nutritional deficiencies. A completely unprocessed, whole food. Your best bet to ensure quality is to buy from a bee keeper local to your area at a trade show or a grocer that carries local bee products. For those of you with pollen allergies, this superfood can actually help treat them! It should be taken 6 weeks before the season begins and continued through the season. This works by desensitizing the body to pollen. 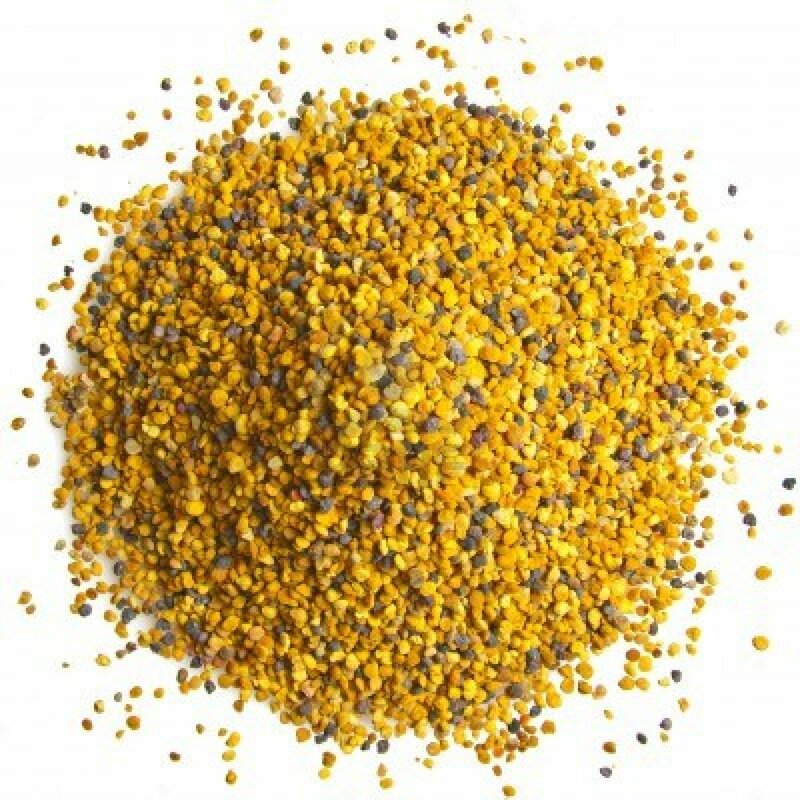 Try sprinkling a teaspoon or tablespoon of bee pollen on your smoothie, salad or on your oatmeal. Vaguely sweet/nutty with a slightly chewy texture, it’s easily palatable and a great addition to any diet. I have a deep love of carrot cake. I find this fact about myself odd seeing as I am fundamentally a chocolate person. But, there it is. I wanted to create a recipe that was healthy enough for breakfast, but could also pass as dessert and quash 3pm treat cravings. 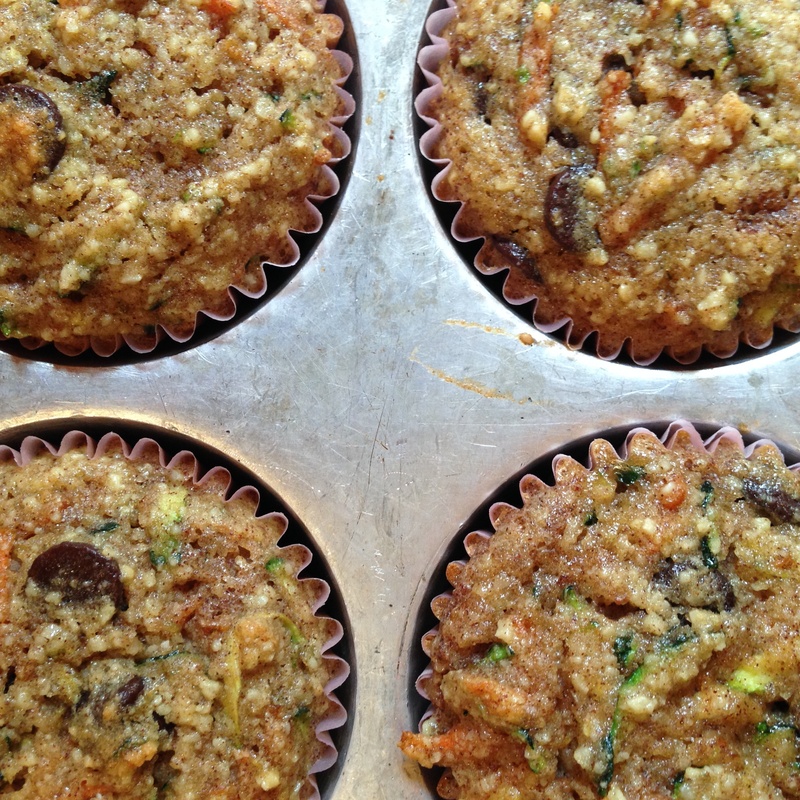 The almond flour gives this recipe richness, while the zucchini and carrot deliver moisture, vitamins, and minerals. I used dark chocolate chips here, but you could easily substitute chopped dates or raisins. Feel free to add a few nuts or seeds as you like. This recipe is also dairy-free. 1. Preheat oven to 350 F. Line 12 muffin pans with paper liners or grease with coconut oil. 2. In medium bowl, whisk together dry ingredients. In separate larger bowl, mix together eggs (beat first), maple syrup, oil. Add dry ingredients to wet ingredients and stir just until combined. 3. Add carrot, zucchini and chocolate chips and stir until combined. Place about 1/4 cup of the mixture in each muffin cup and bake for about 25 minutes, until edges look golden. Let cool in pan for 5 minutes before transferring to cooling rack to cool completely. Enjoy! Last week, the lovely ladies at Husk and I partook in a raw cleanse provided by Rawlicious in Yorkville. It consisted of 5 days of only raw vegan food – breakfast, lunch, dinner & a snack. Consensus was that the Hemp Bar was a favourite item that we got to enjoy. So I decided to try to make them myself at home. They are incredibly easy to throw together and can be enjoyed by everyone since they are gluten-free, dairy-free, grain-free and vegan. Blend all ingredients (reserving the 2 tbsp of hemp) in a food processor or high-speed blender. If using a blender, you may need to scrape down the sides once or twice. 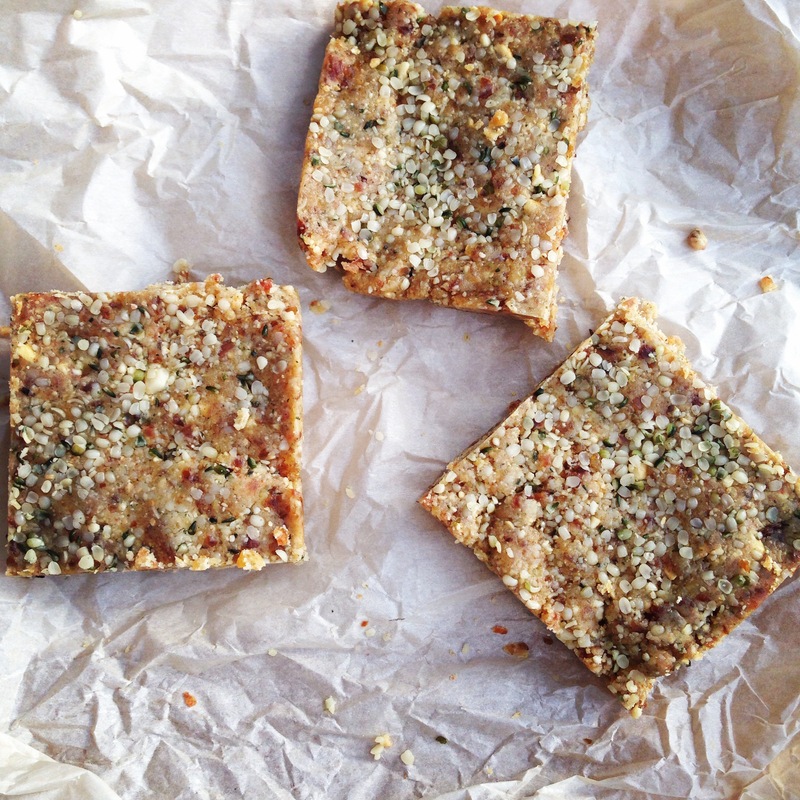 Press into parchment lined loaf pan, sprinkle the extra 2 tbsp of hemp on top and gently press to stick. Place in freezer for 30 minutes, until firm. Remove from freezer and pan and cut into 6 squares. Store in airtight container in fridge. Enjoy with a green smoothie. 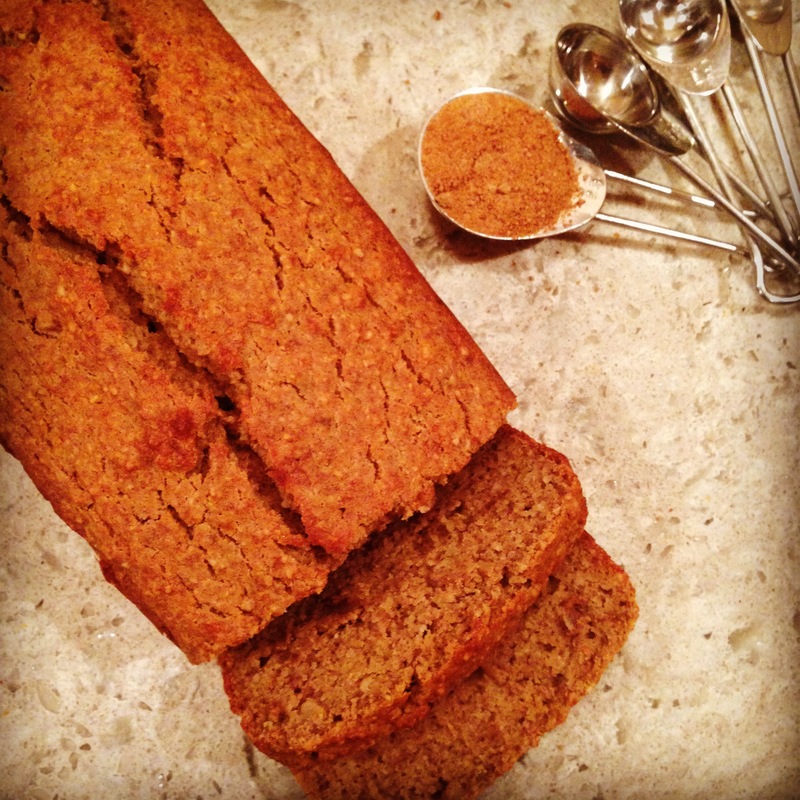 Who doesn’t love a slice of homemade banana bread from time to time? This baked good is a favourite among many and is delightfully easy to whip together if you have the stuff available. I keep an embarrassingly large amount of bananas in my freezer for just such an occasion. I love, love, LOVE the banana bread I grew up on, but the refined sugar and flour means I don’t want to make it a part of my regular diet. So I developed a recipe that’s tasty, subtly sweet, and, best of all, wholesome and nutritious. 1. Preheat oven to 350 F and line loaf pan with parchment paper. Combine bananas, eggs, vanilla, almond milk, coconut oil and coconut sugar in a bowl and beat together. 2. In separate bowl, combine dry ingredients. Add to wet ingredients and stir until just combined. Pour into prepared pan and bake for 50 minutes, or until toothpick inserted in middle comes out clean. 3. Let cool in pan on rack for about 20 minutes. Remove from pan using parchment paper to pull out. Peel off parchment and let loaf cool completely on rack. Enjoy with a cup of tea and a book. It’s official. Kale is mainstream. You’ll be hard-pressed to find a restaurant in T.O. that doesn’t have the leafy brassica on its menu in some shape or form (OK – maybe not everywhere, but you get my drift). Makes sense, since kale boasts an impressive nutritional profile including high levels of calcium, vitamin A, C, K, copper, potassium, iron, manganese, and phosphorus. BUT – for the longest time, I couldn’t find a way to truly enjoy kale, even though I knew that it was truly a superfood. I find it on the bitter side when eaten plain, and sometimes I just can’t stomach it in my smoothie. I remember reading about “massaged kale salad” around a year ago, but never tried it out until recently, and boy, am I glad I did. This easy salad recipe makes it easy to eat multiple cups of raw kale, and even stays fresh in the fridge overnight once dressed (unlike spinach and “spring mix”). In the bottom of a large bowl, mix lemon juice with olive oil. Season with a salt. Add in kale, and, using your hands, toss the kale to coat. Once the dressing is distributed, “massage” the kale with your hands, gently squishing it between your hands and fingers. Get right in there. Do this for a few minutes until the fruit acids, oil and salt have softened the leaves. Add in walnuts. Place on plates and sprinkle with a small amount of freshly shaved (or grated) parmesan cheese. Serves 6 as side salad .